The Committee for Research, Treatments and Cures is now up to $907,500 in campaign contributions. Since Thursday, the committee reported four contributions totaling $127,500, to augment the $780,000 that the committee had reported previously. If you will recall, there had been no contributions of less than $10,000. Now, there’s one: The law firm Stinson Morrison Hecker gave $7,500. Cheapskates. William Gautreaux, a top officer at Inergy LP, $10,000. Inergy’s chairman and c.e.o., John G. Sherman, gave $100,000 earlier. Of course, St. Luke’s Health System and Children’s Mercy are two of the establishments — along with UMKC — that would reap hundreds of millions of dollars from the proposed half-cent sales tax for “translational medical research.” Election Day is Nov. 5. It makes perfect sense that St. Luke’s and Children’s Mercy would put up tens of thousands now to ensure millions later. The capper would be if UMKC, a state-funded school, somehow weighed in with a contribution. You have to ask yourself what some of these companies and individuals expect to get in return for their deep-pocketed support of the tax proposal. Oh, my…All the money and all the possibilities make my head spin. But, wait a minute, are any of these wheeler dealers thinking about the thousands of Jackson County residents who are not making enough money to qualify for Medicaid coverage but who would have to pay an extra $5 or so each month in sales taxes? Oh, and thanks so much to the Missouri General Assembly for refusing in this year’s session to expand Medicaid, even though the federal government would have picked up the tab. If the legislature had voted to expand Medicaid, many of those who are not making enough money to qualify would, indeed, be picked up by Medicaid. – Robert Kipp, former Kansas City city manager and former Crown Center Development president, $50,000. Be sure to see the latest post — “KC Area Already Awash in Medical Research Dollars” — on the stopabadcure.org website. It’s a great day in jimmycsays land and also in the world of the Committee to Stop a Bad Cure, the campaign committee I registered last month to fight the proposed new half-cent sales tax for “translational medical research” in Jackson County. After several weeks of preparation, the committee’s website, http://www.stopabadcure.org, went live this afternoon. I invite you to check it out and give me your comments and suggestions. In addition to the website, we have purchased billboards, which will go up next week in strategic locations. If finances allow, we will advertise in The Star and have yard signs and fliers. The committee has now raised and spent about $4,200. I have contributed all but about $300 of that. If you would like to contribute and help pay specifically for KC Star ads (newspaper readers vote) and printed materials, send checks to the committee at 1209 W. 64th Terr., KCMO 64113. I am the committee treasurer, and that’s my home address. As of last week, the committee for cures had received 17 contributions of $10,000 or more, accounting for all committee revenue. 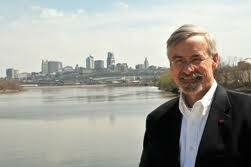 — Robert Kipp, former Kansas City city manager and former Crown Center Development president, $50,000. Note: Missouri Ethics Commission disclosure reports do not indicate if the $100,000 contribution from Donald Hall came from Donald Sr. or Donald Jr. Both are members of the Civic Council, an organization of the area’s top corporate and legal executives. The Civic Council is the money and power behind the push for the tax increase. Those contributions are eye-popping, aren’t they? You need to know this, however: Those contributors realize that if they can foist this tax onto the taxpayers, they themselves will not get hit up for much bigger amounts to help fund the medical research program privately. Privately, of course, is how the bulk of the money should be raised — from corporations, foundations and wealthy individuals. It’s obvious from these contributions that oodles of private money is out there waiting to be tapped. I say, let’s cram it down their throats, Jackson Countians. Gotta tell you about my new hobby. Fly fishing. Patty and I spent a long weekend at Roaring River State Park in southwest Missouri, and I came home with a fly-rod and reel combination and a newfound appreciation for rainbow trout. 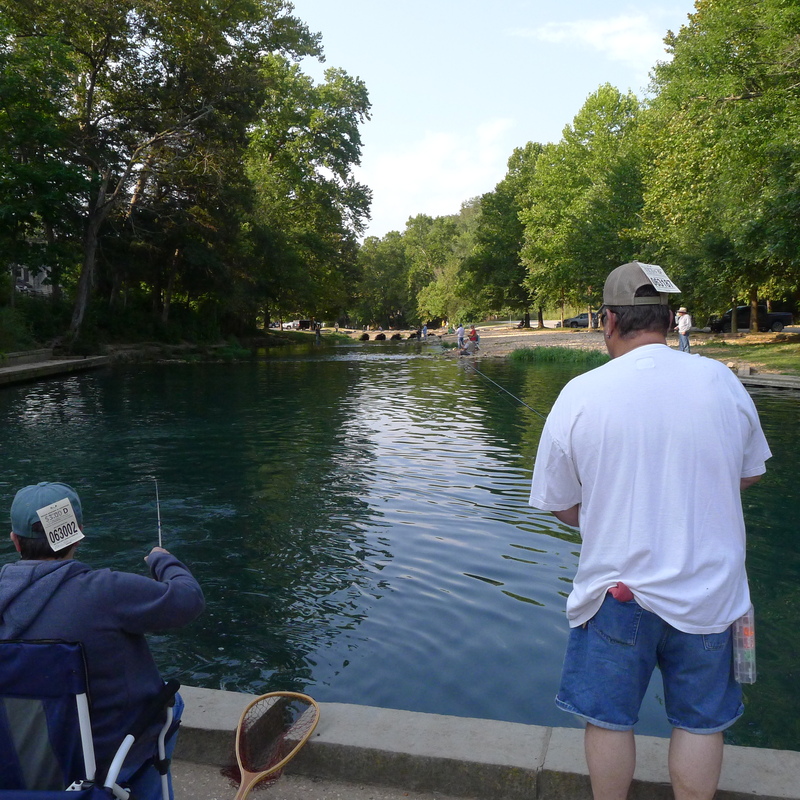 Roaring River has one of four trout hatcheries in the state, along with Meramec Spring, Bennett Spring and Montauk Fish Hatchery. It was by no means shoulder to shoulder along the river — as you sometimes see in photos from the traditional opening day festivities at Bennett Spring — but it’s safe to say that a few hundred people were fishing at any given time. Each fisherman is required to have, visible on his or her clothing, a daily fishing “tag,” which costs $3 a day. A lot of people pin them to the back of their hat. 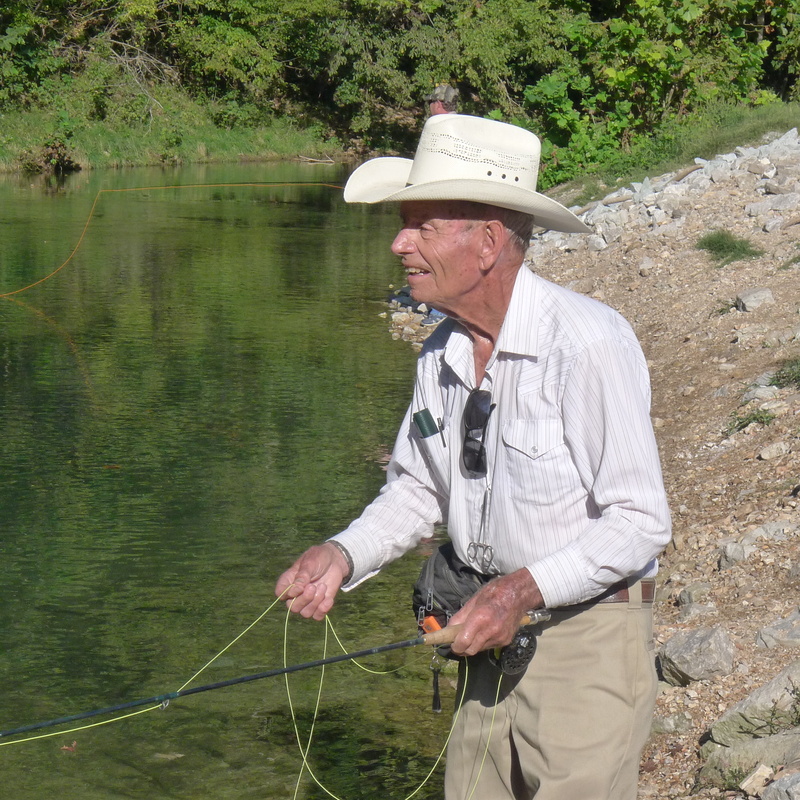 I started out fishing with a spinning rod and reel but soon spotted an old guy who wielded his fly rod confidently and effortlessly. With a slight, sharp movement of his forearm, he brought the line back, waited a second and brought the forearm forward quickly, setting the fly down softly on the far side of the river. With a fixed gaze, he watched the line for signs of a jerking movement. 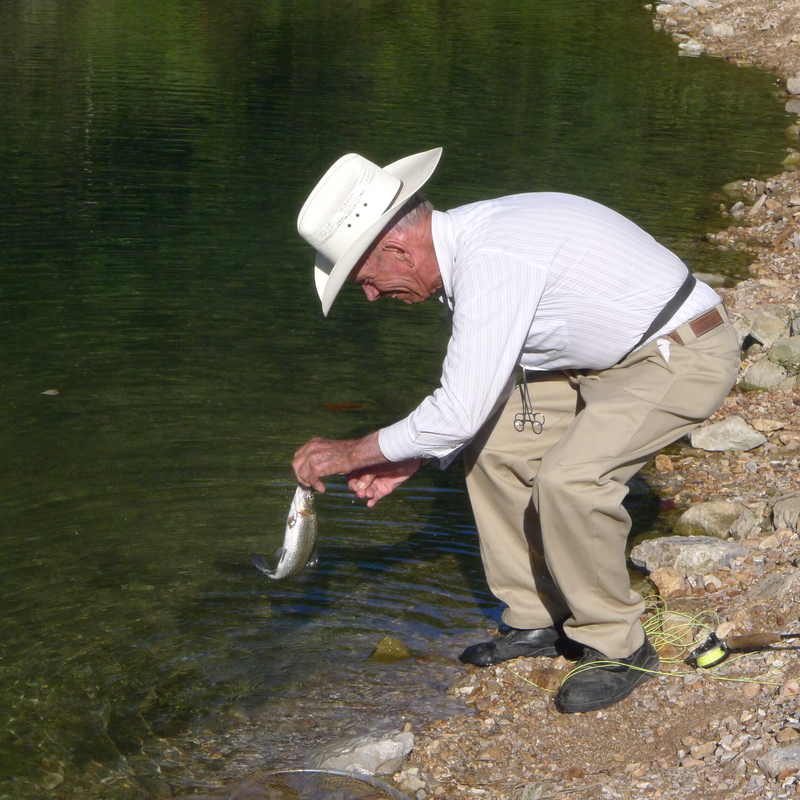 When the line jerked, he jerked back — and usually had a fish on the line. As we talked, one thing led to another, and that afternoon, Friday, I bought the rod-and-reel combination — ready to go — from a friend of Powell’s at a nearby resort. The friend was willing to sell his equipment because he has a rare disorder that has largely disabled his hands. I kept checking in on Adams, when I would see his tan Mazda pick-up parked near the fishing hole that he most preferred. Not surprisingly, it turned out he was a veritable fish-catching machine. On Saturday alone, he caught more than 30 trout, ranging from less than a pound to two pounds or more. Me? I caught two fish — one on Saturday and one on Sunday. The one on Sunday was pretty good — about a pound and a half, I would say. While I don’t expect to become nearly as good as the “cotton farmer from Lubbock, Texas,” I see some nice trout fishing in my future. Powell Adams, a Texas cotton farmer, works the line. He spends about six weeks at Roaring River each fall, before the cotton harvest begins in October. In no time, he hooked one. Looking south from a bridge close to the hatchery. 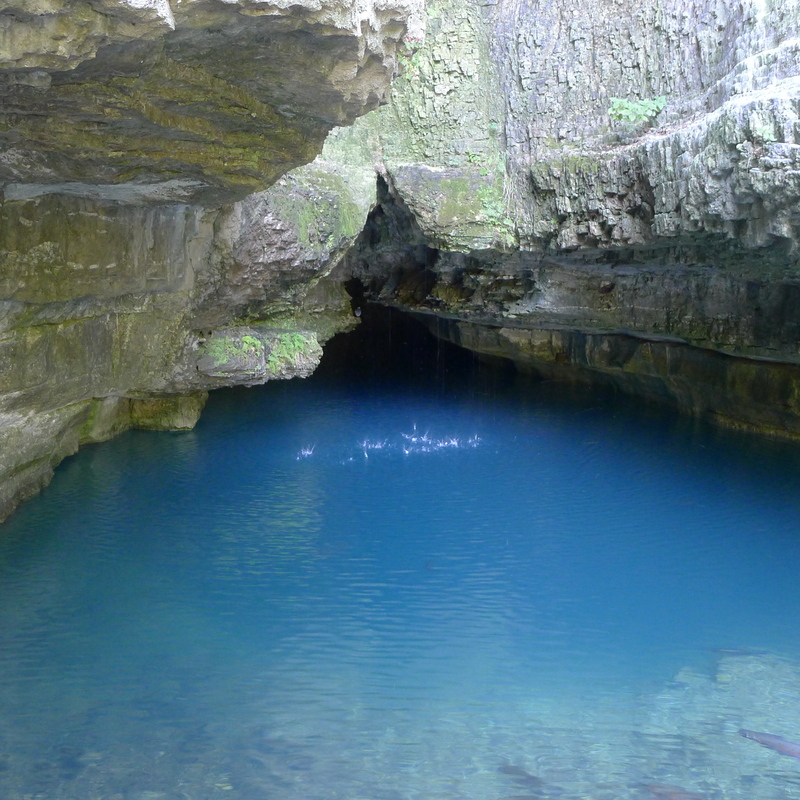 Roaring River begins at this spring and wends its way to Table Rock Lake. 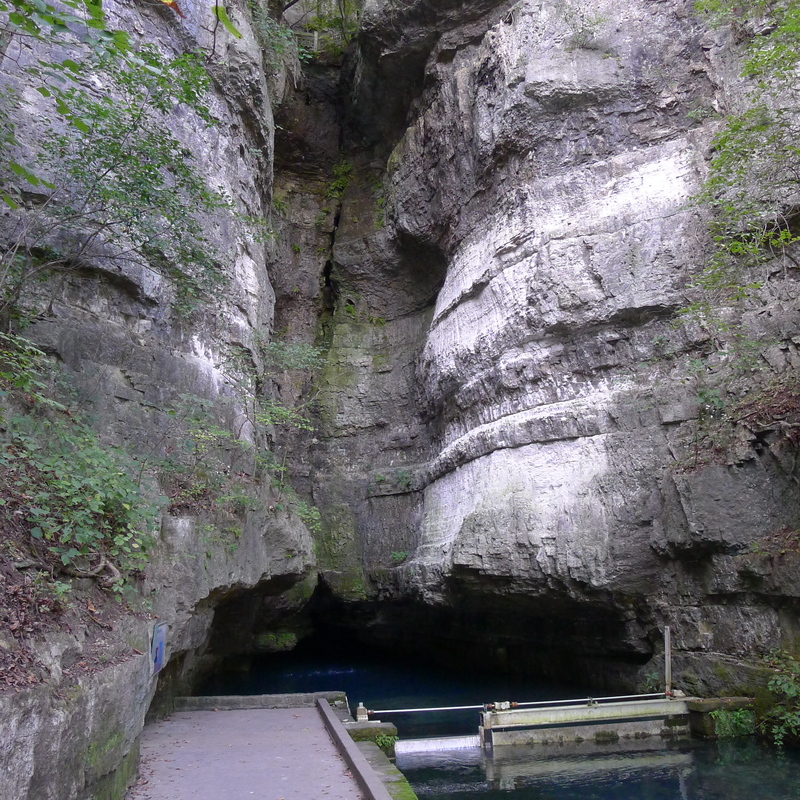 The spring is more than 200 feet deep. 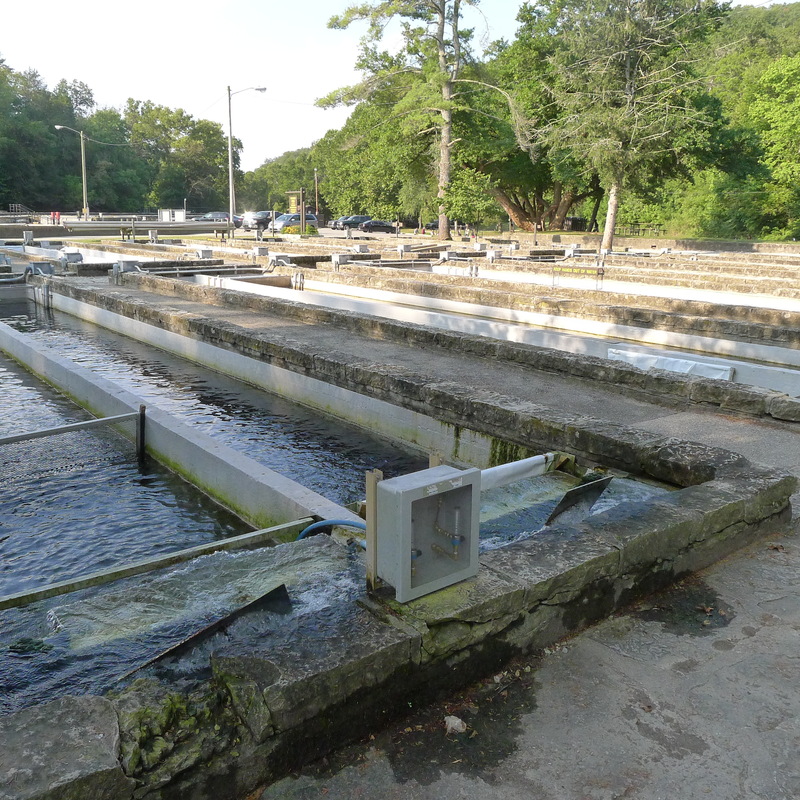 It produces 20 million gallons of water a day. 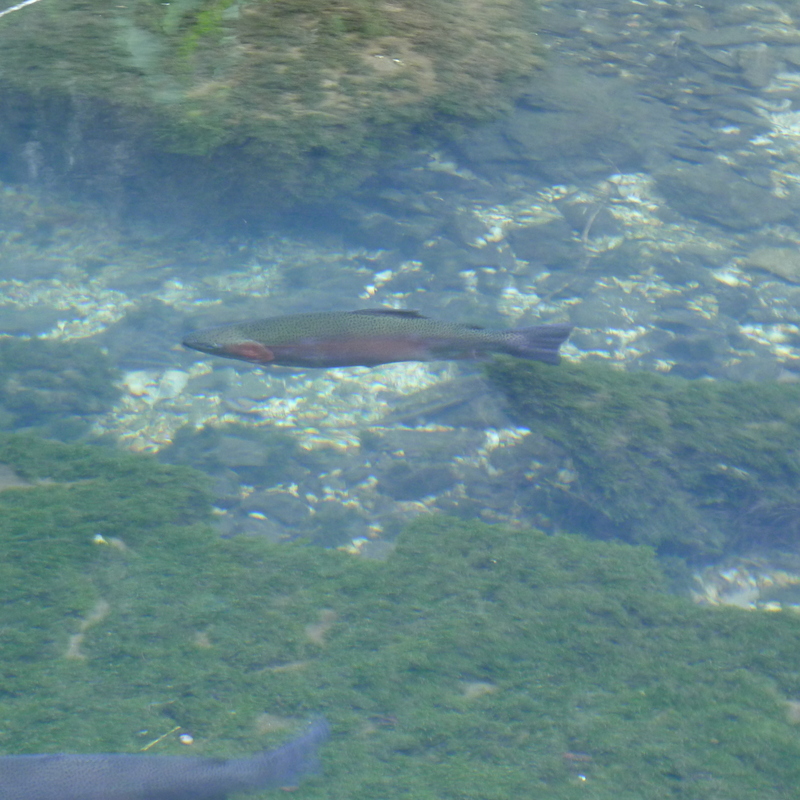 This is one of many large trout that stay in a “pool” area near the spring. 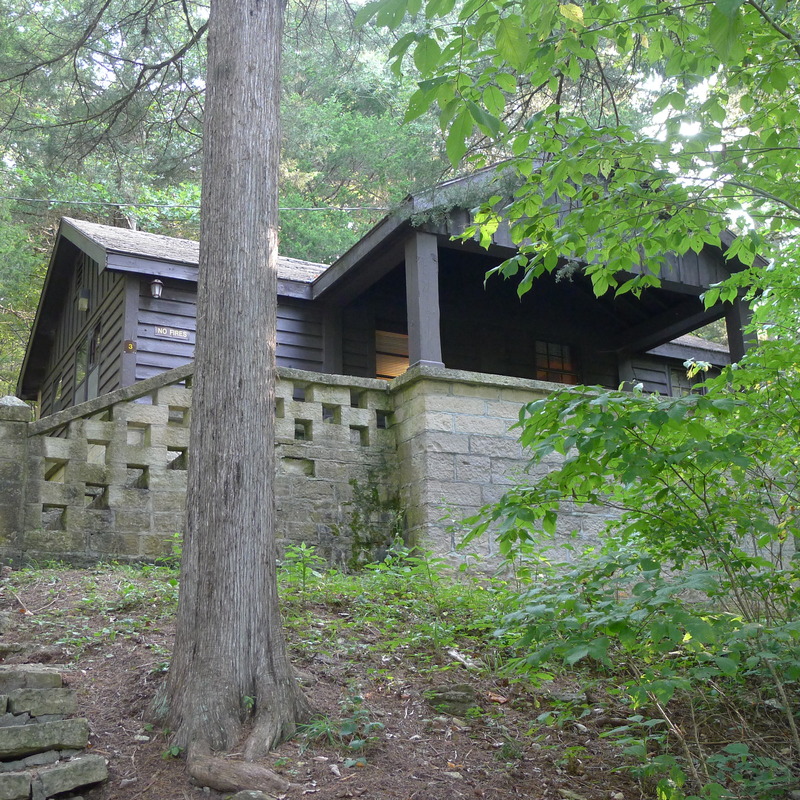 When we weren’t by the river or hiking in the hills, we relaxed at this cabin, built in the Civilian Conservation Corps era — from 1933 to 1942. Regrettably, Hubartos has a bad case of the blues, and I plan on doing some listening and hope to cheer him up a bit. We’ve known each other since we were introduced as four-year-olds — each of us cowering behind his mother’s skirt — on Ruth Avenue in Louisville, Kentucky. …But back to business. Before heading west, I wanted to give you an update on the Committee to Stop a Bad Cure. A dozen people have accepted my invitation to join on as committee members. So, it’s no longer a Committee of One. Welcome aboard, folks, I have a feeling it’s going to be a fun and wildly successful ride. Down with the Civic Council Sales Tax! People ask me what kind of campaign will we have…Quite simply, we’re going to have a low-budget, strategic campaign that will disembowel the other side’s empty-suit proposal. We will have a spectacular website — StopaBadCure.org — which should go up next week. 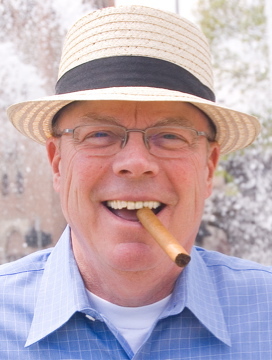 A brilliant young man named Jimmy Koppen is working with me on the logo and website…I’ve known for a long time that Jimmy was brilliant, but he sealed it when he told me to dump the cigar-and-straw-hat-photo for purposes of the campaign. I don’t care, I tell you!!! I gave up cigars about a month ago, but I’m proud of that photo. (A buddy named Greg Corwin took it in 2010 at the J.C. Nichols Fountain.) In fact, I just enlarged it on the “About Me” page. So, go ahead, Glorioso-Gray-O’Neill-Roe and all you other bought-and-paid-for consultants, play it up big! And if you want to bring up the only blemish on my journalistic career — a 25-year-old incident recalled by some as Asphaltgate — have at it! …The gist of it was that Kansas City Public Works crew offered to fill potholes for $30 at some guy’s service station at 59th and Swope Parkway. He told them to come back later. The guy then called The Star and was transferred to me. I went out there and stupidly agreed — as the crew approached the station — to provide the 30 bucks. The asphalt guys ended up getting fired, and then-editor Art Brisbane wrote a column in the paper, admonishing me (without naming me) and apologizing to the public. It all blew over in a few weeks, but The Star rewrote its Ethics Policy to specifically prohibit paying for news. The way I look at it, I played a big role in raising the ethics bar at my beloved paper. Now that I laid that out there, I’m trying to think of what else the opposition might use to try to embarrass me…But I’m drawing a blank. I did have a long and relatively happy bachelorhood (until I got so lonely I thought I was going to die). But who could hold it against a guy that he enjoyed himself during The Sexual Revolution? P.S. The committee needs money ($$$$!) to get its message out and defeat the Civic Council Sales Tax on Nov. 5. I have contributed $3,500 of personal funds to the effort. So far, the committee has received just one other contribution — $95 from a CPA who lives in Independence. Thank you! I guarantee you one thing: Your money will be put to good use. Today, for the first time, I was on the other side of the notebook. As the sole spokesman for the Committee to Stop a Bad Cure, I held a news conference on the steps of the county courthouse and laid out the elements of an alternative to the proposed Civic Council Sales Tax. 2) The Hall family and the Hall Family Foundation redirect its $75 million pledge — taking the onus off the taxpayers and challenging corporations, other foundations, wealthy individuals and the general public to raise $425 million. 3) With $425 million in pledges in hand, private funding would amount to $500 million, including the Hall family’s $75 million. 4) Then, the Civic Council could go back to Jackson County and seek voter approval of a one-eighth-cent sales tax, which would generate about $10 million a year. That tax would have a duration of 15 years (instead of 20) and would bring in a total of at least $150 million over the 15-year period. 5) That would provide at least $650 million in overall funding, thus reducing the program from $800 million. I believe this is a reasonable and proportional approach, and I would support it. Two years ago, I was a spokesperson for the committee that successfully campaigned to retain Kansas City’s earnings tax. But I am strongly opposed to the county’s half-cent proposal, which would have taxpayers forking over $800 million to $1 billion over the initial 20-year duration of the tax. I think the private sector should carry the biggest part of the load when it comes to additional medical research. As I have said before, additional medical research is a luxury not a top government priority. Election Day is more than eight weeks away, and yet it feels like discussion over the proposed a half-cent sales tax to benefit “translational” medical research has already hit warp speed. Today, on my blog site, former City Councilman Dan Cofran, who represented the Fourth District for eight years, came out loud and clear against the proposal. The proposed Jackson County half cent sales tax for medical research is well intentioned but misdirected. The most important thing local government can do for economic development is provide quality basic services, namely, public safety, public education and public works, based on reasonable taxes and user fees. Exhibit A, Johnson County KS. Local government revenues, particularly regressive sales taxes that are already too high, should be carefully marshaled, indeed reduced, and focused on basic governmental services for all citizens. If we do that, the market will respond and people will want to live, work, play, study and visit in Kansas City and Jackson County. We won’t have to use our tax dollars to pay them to come here. All I can say is, thank you, Dan. I say that not only because it provides a general boost to the opposition — including my committee, the League of Women Voters and the Springfield personal-injury lawyer — but also because a very credible political figure has now affirmed what many people have been thinking since the tax notion was dropped on the public Aug. 8 — that it’s a bad idea. In his days on the council, Cofran always stood up for what he believed in. He cow-towed to no one and, as a result, he frequently was on the losing side of issues where money and influence had coalesced. To the issue at hand, Cofran brings an objective, independent voice. He ran for mayor in 1995 and lost to then-Mayor Emanuel Cleaver in Cleaver’s successful re-election bid. At that point, almost all the organized support had gone to Cleaver, and the outcome wasn’t close. Nevertheless, Cofran ran a very creditable campaign and often held Cleaver’s feet to the fire. Glad to have you on board, Dan! At 11:30 a.m. tomorrow, I’ll be holding a news conference on the north steps of the downtown courthouse, 415 E. 12th Street, KCMO. I will be laying out a proposed alternative to the Civic Council Sales Tax. If you want to see me in my black hat, come on down! You know how, at sporting events, you often see those T-shirt and hot-dog guns that launch items high into the stands, toward the jiggling, beckoning hands of fans? Well, Donald Hall Sr. today launched a $75 million cannon-shot toward Jackson County taxpayers, but I think it could easily misfire. The pledge came with a $1 billion condition, however. The condition is that Jackson County taxpayers approve a half-cent, $40-to-$50-million-a-year sales tax increase before the Halls fulfill the pledge. The proceeds would go toward “translational” medical research. The reaction on my blog was quick. I guess Sarah was basically asking if Hall Family was trying to win a popularity contest…because they are already eyeballs deep in the tax proposal. I have dubbed it the Civic Council Sales Tax, because leaders of the Civic Council of Greater Kansas City (like Donald Hall Sr. and current Hallmark c.e.o. Donald Hall Jr.) hatched and are pushing the tax. The measure, Question 1, will be on the Nov. 5 ballot throughout Jackson County. If approved, taxpayers would fork over about $1 billion in sales taxes for medical research over the initial 20-year life of the tax. As many of you know, I oppose the tax and have registered a campaign committee called Committee to Stop a Bad Cure. By holding out a $75 million carrot, the Hall Family and its foundation are hoping that a majority of Jackson County voters who go to the polls on Nov. 5 will bite. I don’t think they will…The nearly universal reaction I have heard to the proposal since the Civic Council dropped the idea out of the blue, clear sky on Aug. 8 has been extremely negative. 2) Aren’t there a lot of other public needs that take priority over this? Naturally, the $75 million, conditional pledge has received quite a bit of news coverage. The Star put a story on its website, as did the Kansas City Business Journal and KMBC-TV, Channel 9. A Channel 9 reporter, Haley Harrison, sent me the news release this morning and asked me to comment. I am a proponent of medical research, and I applaud the Hall Family Foundation’s offer of a $75 million grant to construct a building to house the proposed new institute. Regarding the terms of the grant, I think they’ve got it wrong. The foundation should be challenging other corporations and wealthy individuals to bear the brunt of the cost of trying to make Jackson County a medical research leader. Jackson County residents should not have to bear the load. Medical research is a luxury, not a necessity. The county and Kansas City have plenty of higher, unfunded priorities right now. In addition, while $75 million is an impressive figure, it is still less than 10 percent of what taxpayers are being asked to fork over for “translational” medical research over the next 20 years. Harrison added my response, in its entirety, to her story. Eric Adler, who wrote The Star’s story, quoted the leader of another opposition group, Citizens for Responsible Research. The leader of that group is a Springfield-based, personal-injury lawyer named Brad Bradshaw. Brianne Pfannenstiel, who wrote the Business Journal story, did not quote either me or Bradshaw, but she said she arranged to call me tomorrow to discuss the tax proposal. I guess it’s going to take a while for JimmyCsays and the Committee to Stop a Bad Cure to be afforded a chance to respond to everything the Civic Council and its campaign committee do. But don’t worry: There’s a ton of natural resistance to this tax proposal, and I will wave the opposition flag as high and as conspicuously as I can. We, the people with mid-level incomes and lower, are against this, and there are a lot more of us than there are of them.